I found this lamp at Crate and Barrel a few months ago and LOVED it! But, $79 ? Um...no thanks. Then I found this vase at HomeGoods. Love your beautiful lamp, Janie....pretty ingenious!! Beautiful, Janie! I LOVE what you are doing with your living room. It has changed a lot since we were there last! What was that Martha Stewart? Oh, you think Janie should take over your show? Yeah, me too. So THAT'S how you did the lamp! You are one smart cookie DIYer! My hero. That is beautiful! 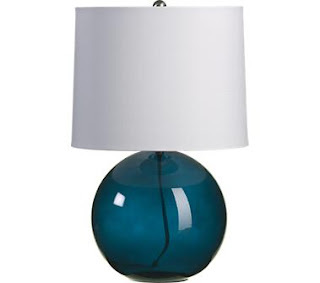 I am in love with the color and shape of this lamp. That looks fantastic! What a great idea. This is unbelievably great. Better than the inspiration lamp by far! I am SO going to HG tomorrow! I've been ooohing an ahhing over a certain PB lamp for some time but can't get myself to pay $200 for it. I think I can handle this! Thanks so much for the inspiration! That looks fantastic! You're so creative! I love it, it would look great in my living room. LOVE this DIY. What a brilliant idea. ;) And SO much cheaper. Don't know if you remember me, but we met maybe 10 years ago through a mutual "friend." :) You have a lovely family! And I enjoyed reading your blog!